A few nights ago, in the throes of insomnia, I did the thing I always do when I can't sleep; I perused endless news blogs and ordered a pile of books on Amazon. Sometimes when I do this, a package arrives days later and I open it and think, "Huh?" My judgment at 4 AM can be a little clouded. 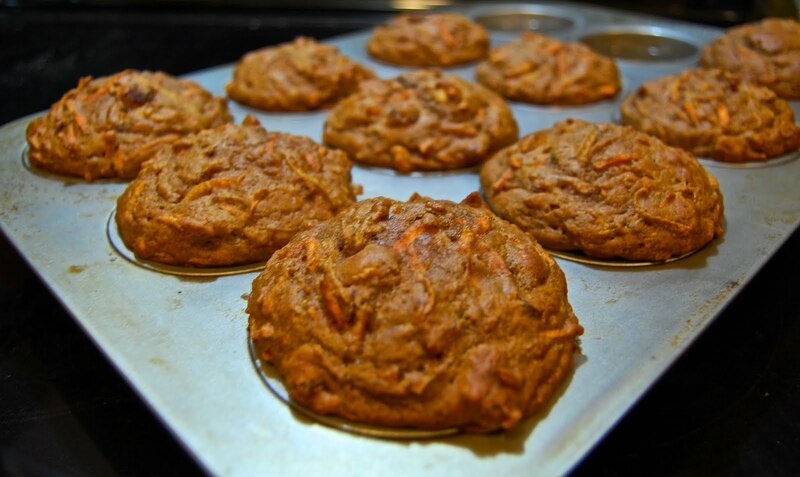 This time, I had ordered three vegan cookbooks after reading about Bill Clinton's impressive transformation and following a Google thread for a deeper look into the lifestyle. It wasn't the first time I had considered veganism; except for a brief period of vegetarianism in my teens, my diet has never reconciled very well with my love and respect for animals. 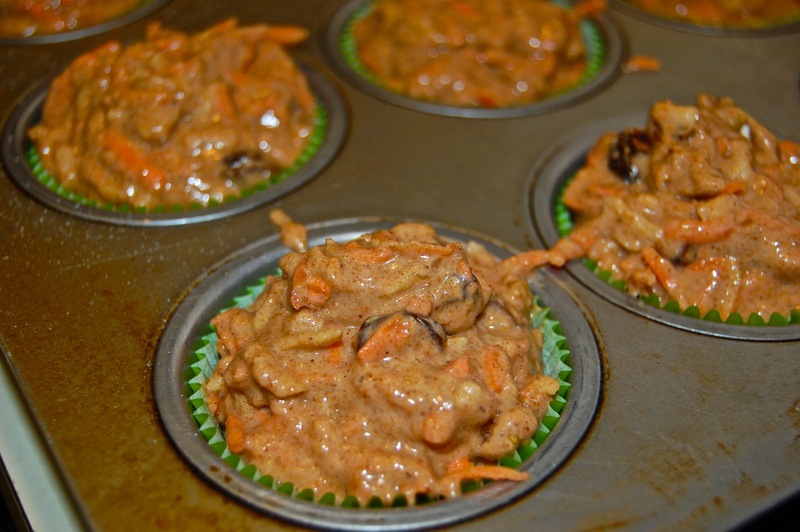 I figured I could at least explore adding vegan meals to my repertoire, but first I would need help familiarizing myself with uses for a few of the mainstays: tempeh and seitan. 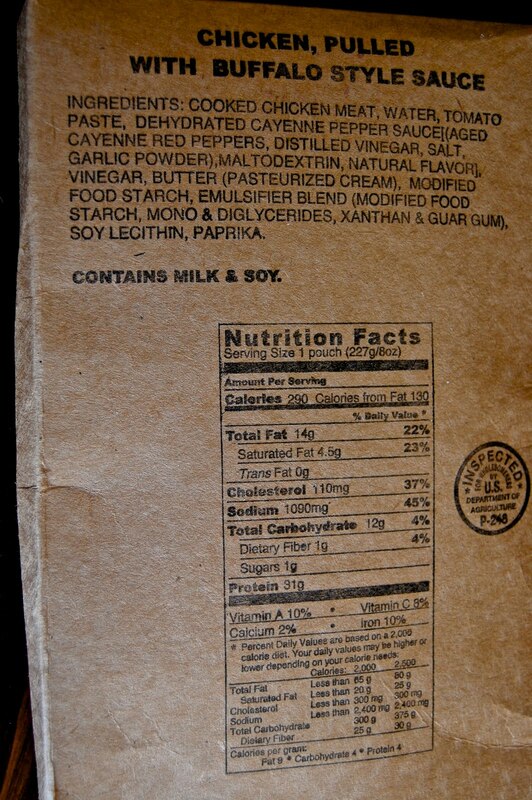 For this post, I went with tempeh. Although I have eaten tempeh at restaurants, I hadn't cooked with it so I was surprised to discover a good variety representing assorted legumes and grains. I started with a classic soybean tempeh, and found the recipe below in Veganomicon by Isa Chandra Moscowitz and Terry Hope Romero. Since I love fish tacos I thought it would be interesting to see if these tacos could hold their own against others in the class. The recipe calls for a beer marinade spiked with typical barbecue seasonings and garlic. Since the tempeh is best prepped a day ahead to marinate overnight, I prepared the accompanying slaw and crema too while I was at it so I would be set for a quick meal the next day. 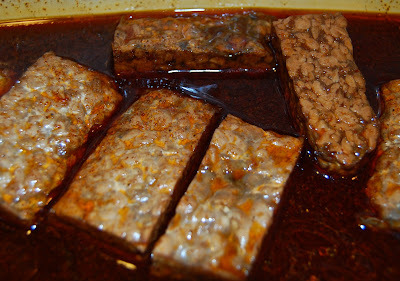 The following evening I removed the tempeh from the marinade (reserving the marinade), but instead of browning all the pieces at once, I started with a few to get an idea how they tasted in case the flavors needed tweaking. I browned them in oil and finally basted them with a bit of marinade until the pieces were coated with a nice glaze. Then I sliced the chunks crosswise and tested a sample. 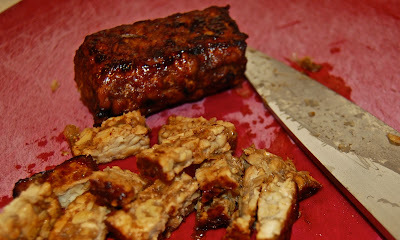 For my taste, the tempeh was bland, despite all the seasonings in the marinade. I decided to apply a quick rub of cumin and chipotle chili powder to the other pieces before browning them. This helped form a spicy crust and perked up the flavors considerably. The red cabbage for the slaw was quickly shredded in a food processor. I followed the instructions and added apple cider vinegar, but later wished I had used lime juice in its place. 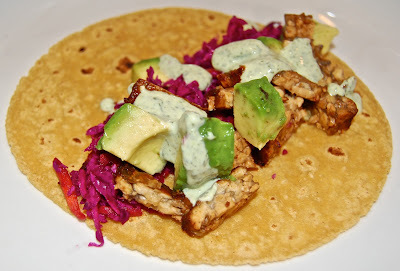 The slaw was very acidic which I knew meant I wouldn't be able to pile it on for the crunch I like in fresh tacos. The crema called for non-dairy yogurt but since I didn't have it I defied vegan rules (that didn't take long; oh well, one step at a time) and used 2 percent Greek yogurt. I also left out the oil because the crema was rich enough without it. The tacos were very enticing to look at, but I wasn't completely satisfied with their flavor. Mostly, I was disappointed by the harsh vinegar clang. 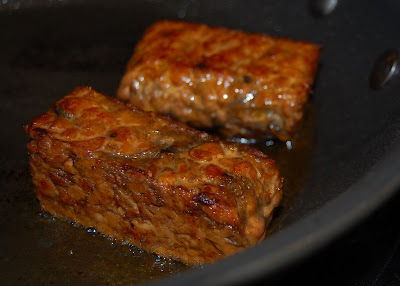 Although tempeh looks rich and meaty, it's actually too lean to stand up to all that acid in my opinion. Maybe the authors use a mellower cider vinegar, but if I make these again I'll use lime juice in the slaw, and not too much of it. Also, I'd leave out the pickled jalapenos (more sharp acid) and rely on a shot of hot sauce on top instead. I realize vegan veterans may disagree with my comments completely! I'm not an instant convert, but still very interested in exploring more recipes from my new books in posts to come. Philosophically and medically, veganism is looking more and more like a no-brainer. Maybe one day I'll get there. Mix all ingredients in a glass bowl. Cover with plastic wrap, pressing it down on top of the slaw. Weight the slaw down with a can of beans or a full pickle jar and place in fridge to sit for at least an hour. Slaw improves the longer it is allowed to mellow. When ready to use, squeeze out handfuls to release any excess juice. Blend ingredients in a blender until creamy and smooth. Add more salt or lime juice if desired. Pour into airtight container and chill for an hour. 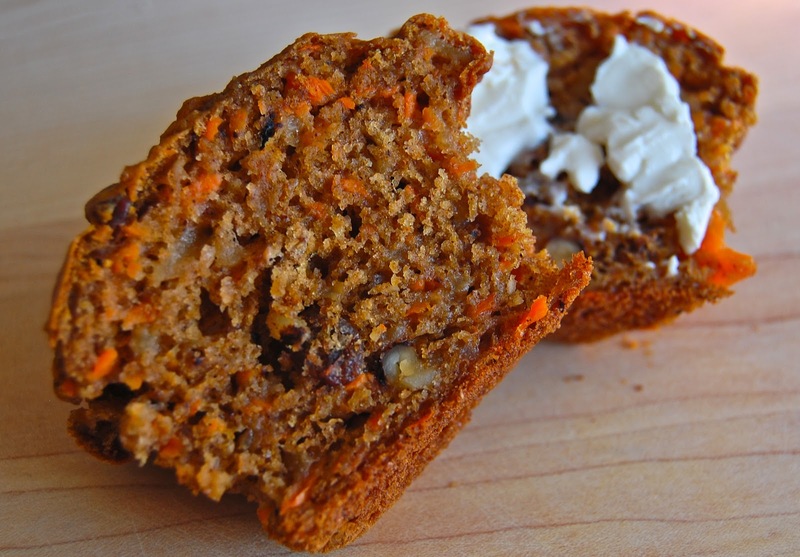 Whisk all the ingredients together and pour into a glass pie plate or casserole dish. Bring a pot of water to a boil. Slice the tempeh into 3 pieces lengthwise, then slice each in half horizontally through the middle. 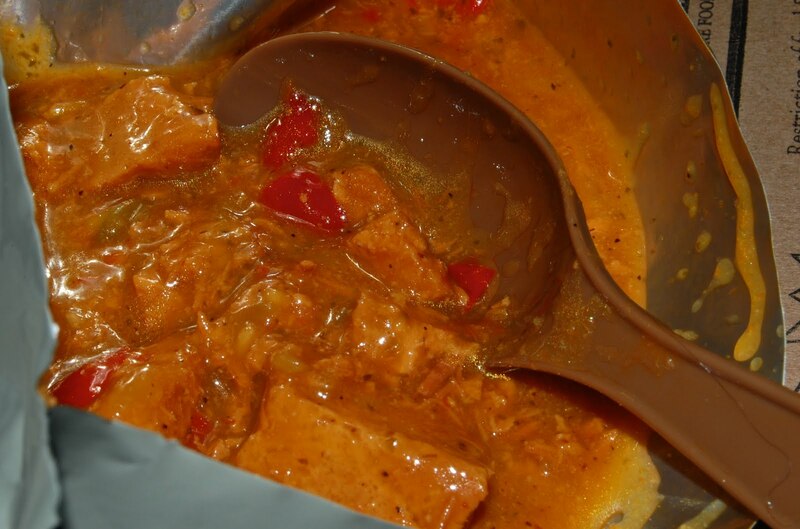 When the water is boiling, add the tempeh, lower the heat and simmer for 10 minutes. Remove tempeh from water and place in marinade. Marinate for 1 hour, flipping them occasionally. 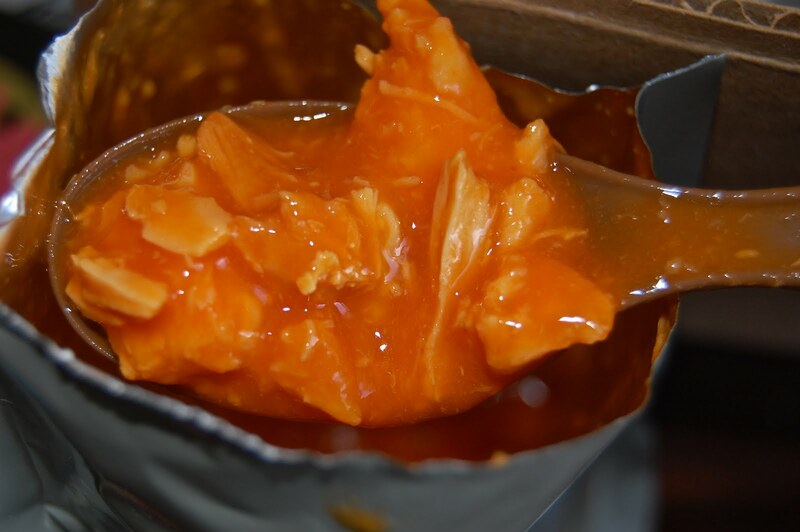 Preheat the oven to 200 degrees F. Liberally grease a grill pan with peanut oil and place over medium high heat or coat a heavy skillet with enough peanut oil to lightly coat its surface, and preheat. Remove pieces of seitan from marinade with tongs. **Reserve marinade. Grill or fry each side of the tempeh pieces for 5 minutes. When each side is almost done, spoon some of the marinade over the tempeh at let it cook for 30 or more seconds. Remove the tempeh from the heat and slice into thin strips. Keep warm, covered in foil in the oven while preparing and assembling tacos. Continue to heat your heavy skillet once the tempeh is done. If the skillet is too sticky use a new one or wipe it down to continue. Heat corn tortilla in the skillet for 30 seconds, then flip it and heat until it has become soft and pliable. Repeat with second tortilla and arrange both, slightly overlapping, on serving dish. 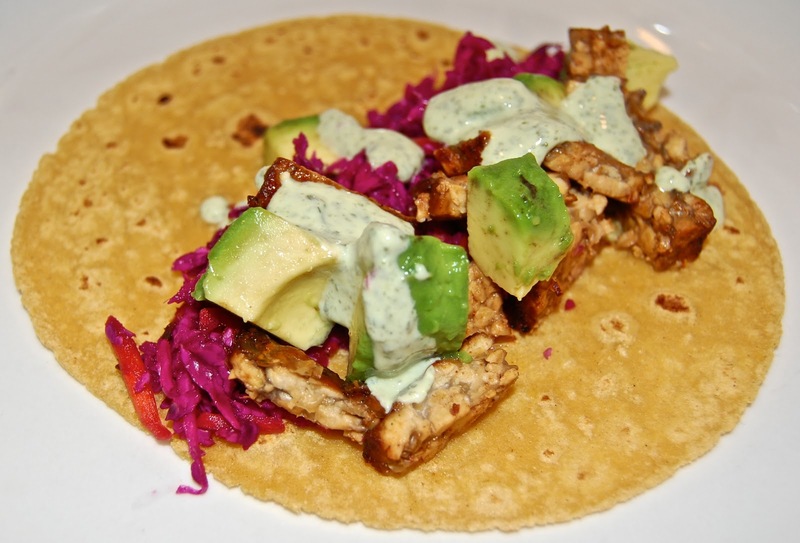 (Using 2 tortillas per taco allows heavier toppings.) If not using immediately, stack tortillas, wrap tightly in foil and keep warm in oven. 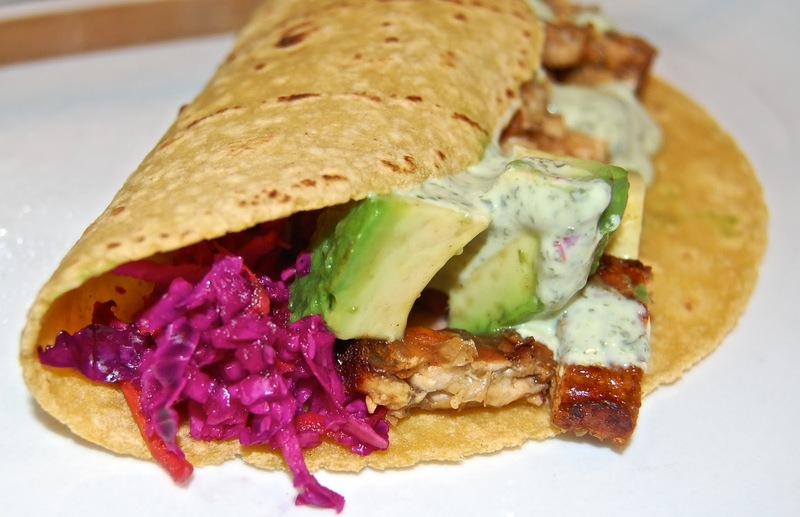 Spread a little crema down the center of the tortillas, add some slaw, top with tempeh and garnish with whatever you like. Drizzle on extra crema and hot sauce, if desired. Fold and eat. I mixed a heaping tablespoon each of chipotle chili powder and cumin to create a rub for the tofu pieces. Roll tofu in spices after marinating and before browning in skillet. If I make this again, I'll use lime juice in the slaw and omit the pickled jalapenos. I used 2 percent Greek yogurt in the crema and omitted the oil. I imagine you have all heard by now about the destruction wreaked upon Vermont by hurricane Irene on August 28th (if you haven't experienced it firsthand). I have to admit, before Irene struck I always thought we were immune to the kind of wide-spread devastation commonly visited upon the U.S. coasts and plains. Other areas suffered hurricanes, tornadoes and earthquakes; I just shook my head in pity and wonder as their stories played on the national news. So it was sort of surreal to wander out the day after the storm to find roads splayed open or washed away, acres of crops flattened to the ground by surging, contaminated waters, bridges condemned and houses torn from their foundations and splintered into flotsam. The day of the storm, my husband and I were totally unaware of the ferocity of the flooding all around us. I watched the rain through picture windows all day, rather unconcerned as nary a twig came down in the back yard. Aaron headed to Lake Champlain to check our sailboat, then shared a drink and swapped jokes with the marina owner as they kept watch over the boats tugging at their moorings. It wasn't until he headed home, just after dark, that he came upon a closed road, and then another closed road... and it became clear he was going to have to desert the car and walk a good distance through the storm. I was able to pick him up at the far end of the road, which was still passable, and we each gaped in shock at the jagged chasms ripped into the pavement by overflowing culverts. Just as we returned home, the power went out, so we lit a fire and checked for news on our cell phones. That's when we learned of the severity of the destruction throughout our county and further south. We discovered that some towns were completely cut off, with no intact roads out. A Facebook page dedicated to acute flood needs and offered services went up, and calls were met with sometimes overwhelming support by volunteers. It was heartening to see so many strangers pitching in to help strangers, a drive which continues to this day. 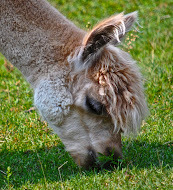 My efforts have mostly veered toward the feeding (what else) of humans and pets, as well as surprising volunteer sludge-shovelers and a thirsty road crew with styrofoam coolers packed with beer and ice at the end of their work day. Aaron split wood for our local wood-burning pizza spot, American Flatbread, which lost 25 cords down the Mad River. He also offered his services as a musician to various morale-boosting community events, including a benefit in Moretown - one of our hardest hit neighbors. It was there that he saw a stack of disaster relief packages deposited by FEMA at the height of the crisis. By then, the takers had apparently dwindled to none, probably because power had been restored to the area and more palatable food provisions were being supplied by zealous volunteers. 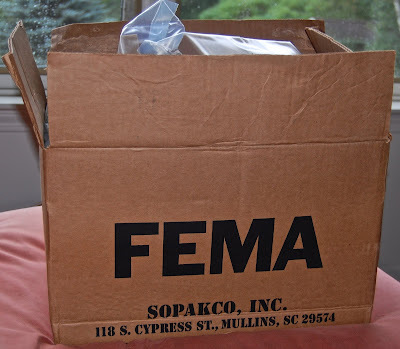 So when Aaron saw kids tearing into the packages and playing with the meals for fun, he decided to bring a FEMA box home to me, because he thought I'd be intrigued by its contents - and he was right. 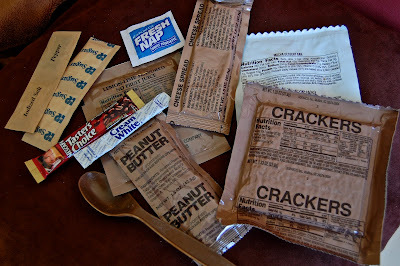 It's not every day that civilians like us get a glimpse into military-issue rations, so I thought you readers out there might like to learn what they're all about too. I have to say, the Chicken with Tomatoes and Feta Cheese, with its decidedly Mediterranean angle, threw me for a loop (not to mention that a consumer review on the manufacturer's website deemed it "Superb!"). I decided to start with that one. 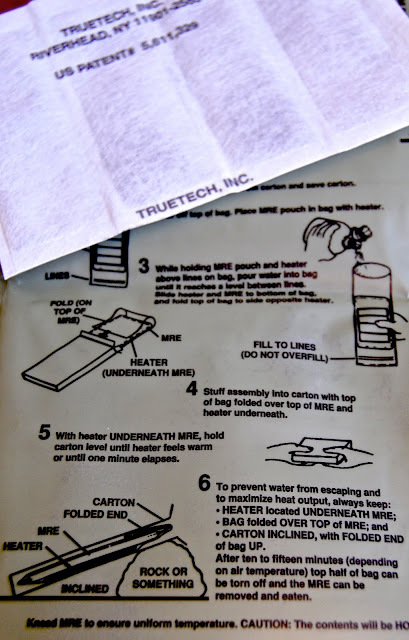 Carefully following the instructions, I placed a heater and the foil meal packet into the enclosed plastic bag and added water. Immediately, the bag burned my fingers and a puff of acrid smoke wafted from the top. 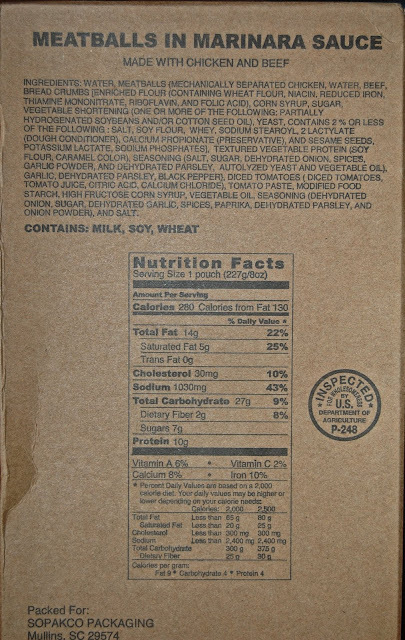 I quickly closed the bag and stuffed it back into the cardboard box the entree had been packed in. The instructions advised that for optimal heating the package should rest at an angle, against a "rock or something." That detail conjured images of displaced disaster victims and combat soldiers alike searching for something to lean their sad little meals against, and my heart went out to them. As I waited the allotted 15 minutes, the meal sizzled audibly in the box. Finally, I opened the foil bag and reached in with a plastic spoon to stir its contents. 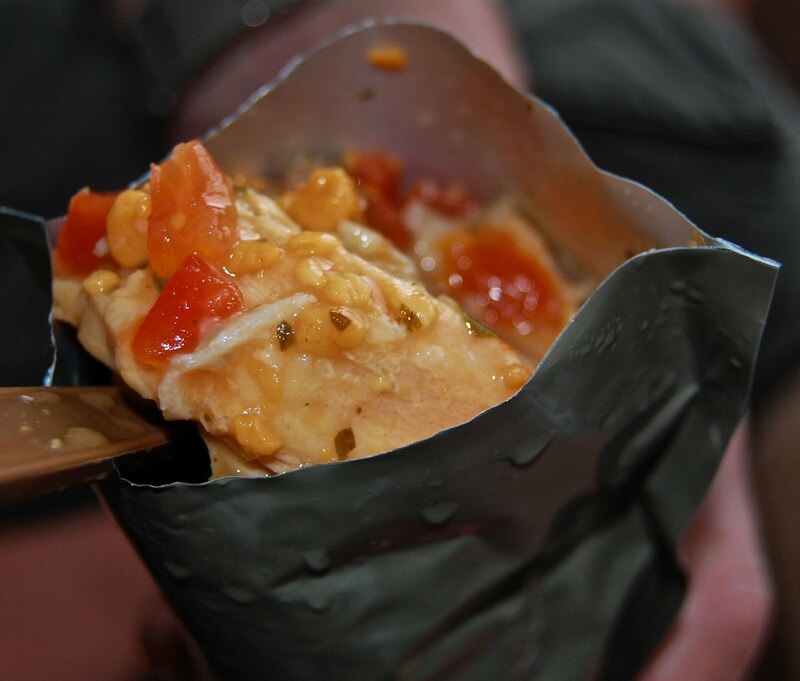 I was surprised to see one large chunk of chicken surrounded by a light sauce, studded with tomatoes. 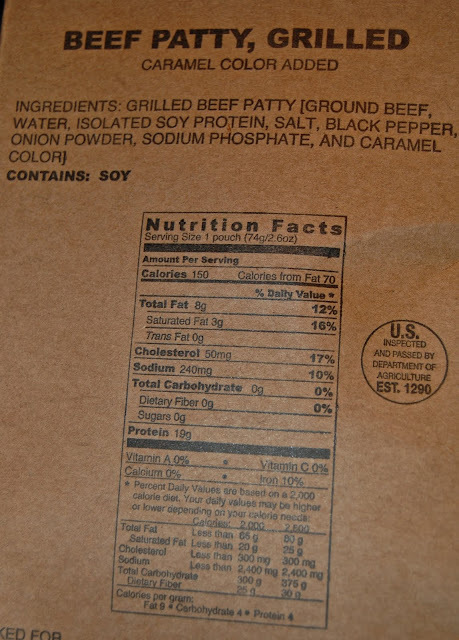 At first I thought it was a processed patty, but once I broke it up with my spoon in a bowl I realized it was real chicken. I steeled myself for a taste. First impression: salty, but not completely vile. The chicken was a little dry, but perfectly edible. There were no visible pieces of feta but there was a cheese note to the sauce. It could be the meals are intentionally high in sodium to replenish losses from sweating. All in all, if I were cold and starving, out in the elements, I'd be grateful to have it. I couldn't say the same about the "Beef Patty, Grilled." I was dubious about this one from the start, but when I opened the heated packet and got a whiff of its contents I was deeply revolted. 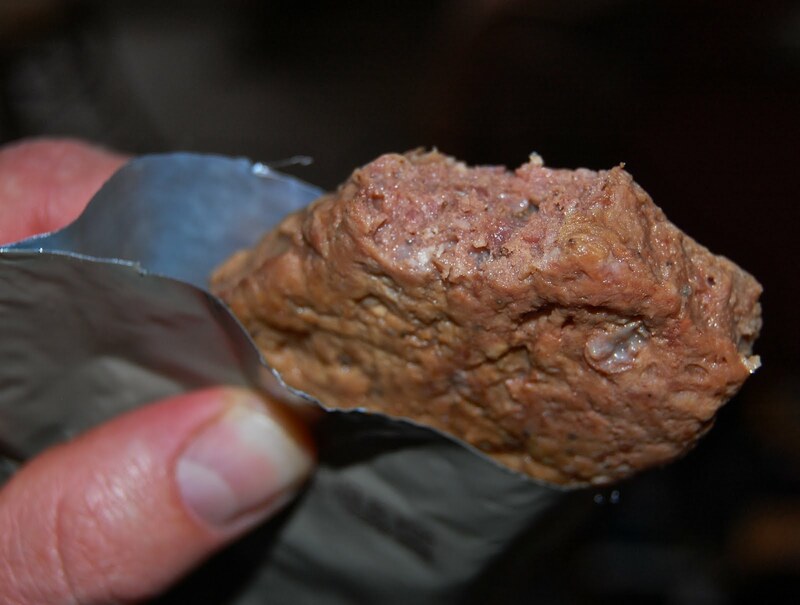 Its grisly, congealed appearance didn't help either. I decided maybe Aaron could taste it for me, but he wouldn't do it if I didn't do it, so we each took a tiny bite. Now I think we both know what dog food tastes like. It was so bad that spitting it out wasn't enough; my skin crawled as I ran to the sink to gargle, almost in a panic. I can't imagine why this selection remains in rotation; no one could possibly prefer it over the other offerings, especially since there was no mustard or ketchup included with it. 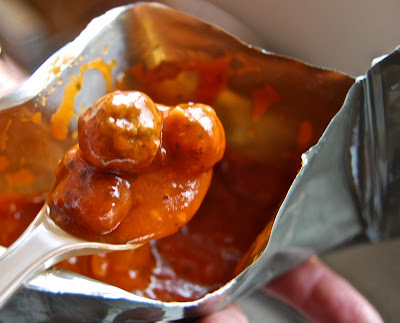 Next up was "Meatballs in Marinara Sauce." This one smelled like airplane cabins used to smell when they actually heated something up for you to eat. The meatballs swam in a bright red, slightly unctuous sauce. 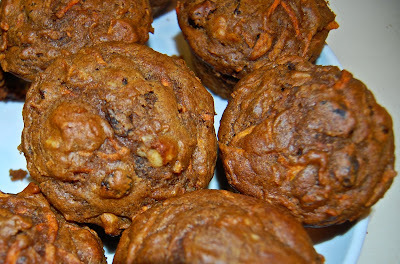 They were small and weirdly resilient, but didn't taste too bad. Aaron surprised me by saying he was going to save the rest for his lunch (it was like I didn't know who he was anymore!) but by the time noon rolled around, he thought better of it. I had higher hopes for the "Chicken, Pulled, with Buffalo Style Sauce." I figured cayenne and vinegar could go a long way toward masking undesirable qualities, and that turned out to be true. 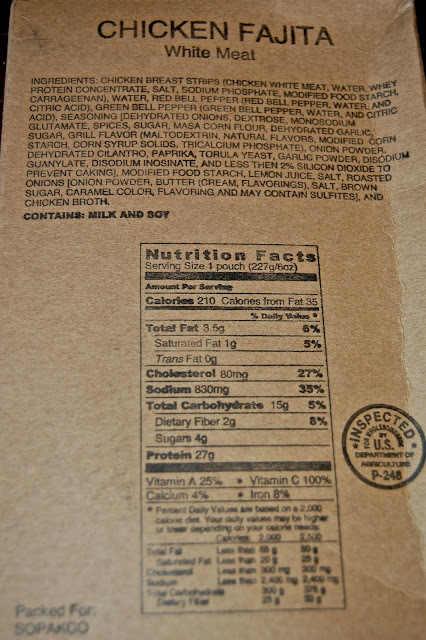 It was actually quite tasty by MRE standards, and the chicken was surprisingly moist. This was the most acceptable one so far. Finally, since I was fast developing MRE fatigue, I picked one more to try: "Chicken Fajitas." Now, when I think of fajitas, tortillas play a key role - but not in this case. Dry, white crackers, ubiquitous with every meal, must act as fill-ins. The appearance of the chicken reminded me of Fancy Feast "chunky chicken," and the texture was slimy. Red peppers lent some color and flavor but otherwise it was bland. 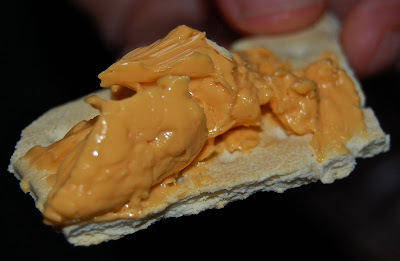 Each meal came packaged with plastic utensils, salt and pepper, a wet-nap, a cookie or bar of some kind, crackers, peanut butter and "cheese" spread, pictured below. A message printed on the box implores one to eat everything, as the calories of the entire meal are calculated to meet the needs of active soldiers. I can't imagine it's pleasant eating Meatballs in Marinara Sauce and peanut butter and crackers in the same meal, but I'm sure for the people eating these things that's the least of their problems. It's definitely unnerving to eat anything with an expiration date of 2023, especially animal flesh. 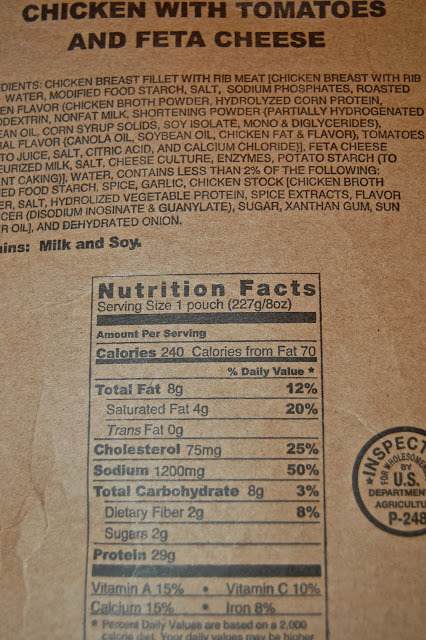 And it's too bad that trans fats, being cheap and apparently infinitely shelf-stable (! ), as well as high-fructose corn syrup, figure regularly into the meals. But as far as flavor goes, some of them weren't as bad as I anticipated, and I assume they're not meant to supply long term needs. Still, next week, I'm cooking dinner for a family in Moretown. 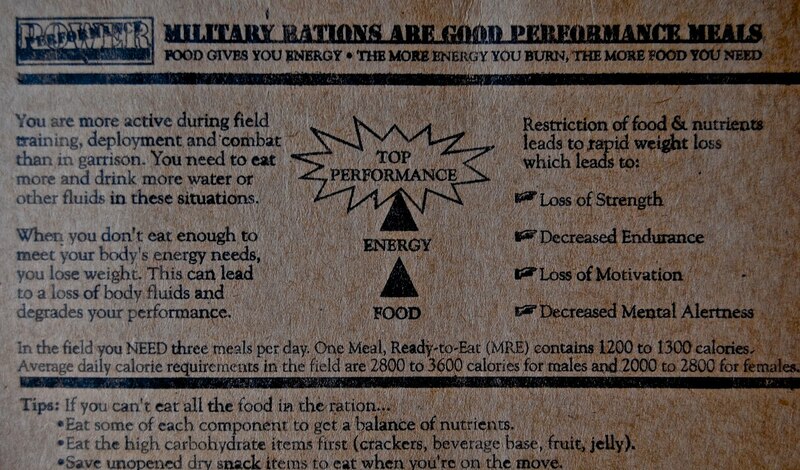 After experiencing MRE's first-hand, I think I'll put that much more love into their meal!